Note that the photos are not to any given scale, but have been individually sized to fit the space in the web page. Also, note that some of the photos may appear to be different sizes with different browsers. So the relative sizes found in the photos are not indicative of the relative sizes of the interchanges. A size guide is included with each photo for comparison. The size guide compares the length of the interchange measured along the freeway (not the area), relative to the urban diamond interchange, which is given a comparative size of 1. The numbers in brackets are explained below. Please note that north is up in all photos. An interchange where all turns and traffic movements are possible is called a complete interchange. An interchange where not all of the turns and traffic movements are possible is called a partial interchange. Federal highway policy now discourages the use of partial interchanges except in special cases. Weaving is the crossing of two traffic movements where one movement changes lanes to the left across another movement changing lanes to the right (see sign). Following distances must be doubled before the weave so the cars have enough room to change lanes. For each lane entering the weaving section, its normal traffic capacity is reduced, divided by the number of lanes in which any weaving takes place. Ramps on older freeways are much closer together. This causes traffic backups, as entering traffic changes lanes across exiting traffic changing lanes the other way (weaving). In the worst cases, major routes had to weave across each other. Short weaving sections like this are gradually being eliminated. Collector-distributor (CD) roads are used to lower the speeds at the ramps, allowing closer ramp spacings. At least 40 seconds of travel time is needed between ramps. Other changes came to interchange design as more was learned. Placing ramps on the left* side is incompatible with laws requiring slow traffic to keep right*. Most interchanges now have nothing but right-hand* exits and entrances. And the need for acceleration and deceleration lanes on the ramps became known. * In countries that drive on the right. Trade left and right in the text above for countries that drive on the left. Partial interchanges can help where ramps would otherwise be too close together, but access is still needed. The partial interchange still allows ramps in the direction where the 3/4-mile spacing exists. Traffic wanting access in the other direction can use surface streets to reach the existing close interchange. Since federal highway policy now discourages partial interchanges, collector-distributor (CD) roads are usually used instead (see below). Legs (n) is the number of approaches to the interchange. Highways (h) is the number of two-way marked routes passing through the interchange. - Do not count a route that ends at the interchange. Total paths (t) is the number of paths through the interchange including U turns. - Total paths (t) is found by squaring n.
Principal paths (p) is the needed number of paths for a complete interchange without U turns. - Principal paths (p) is found by multiplying n by (n-1). Thru paths (m) is the number of highway paths through the interchange in both directions. - Thru paths (m) is found by multiplying h by 2. Actual paths (a) is the actual number of paths through the interchange excluding U turns. U-turn paths (u) is the actual number of U-turns in the interchange. Ramps (r) is the number of ramp paths needed to form a complete interchange. - Ramps (r) is found by subtracting m from p.
Note that a ramp with an intersection at one end can handle more than one path. Use of "[|a|p|u|]" in each entry shows interchange completeness using the actual, principal, and U-turn paths (u > 0 if U turns exist). 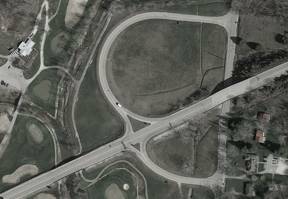 The pretzel interchange is an old design partly based on the design of the old traffic circle. It was intended to reduce the number of bridges needed for the interchange. But it has all of the disadvantages of the old interchange designs: left-hand ramps, weaving sections, no lane balance, sharp turns, and lack of space between ramps. 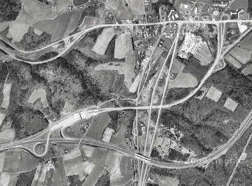 Interchange design changed as more was known, and many old interchanges were redesigned and rebuilt to be safer and more efficient. Most highway interchanges are now designed with no left-hand ramps, no weaving sections, proper lane balance, enough space between ramps, no sharp turns, and acceleration and deceleration lanes on the ramps. 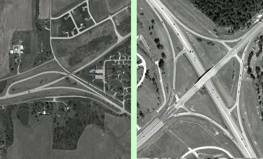 The second photo is an aerial view of an old-style interchange that violated these rules. It has off ramps too close to preceding on ramps, major flows weaving across each other, sharp turns, and left hand ramps. These are often called pretzel interchanges, because of how the ramps curve like pretzels. 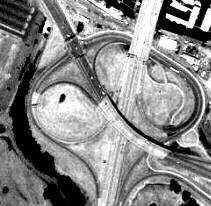 One feature of many pretzel interchanges was that one could keep driving around and around in the interchange without leaving it. This "Pretzel-Bender" interchange is no exception. It contains the actual shape of a pretzel. It used to be at the junction of I-70 (Interstate 70), I-64, US-40, and US-61, at Wentzville Missouri. I-70 runs east and west (left to right). US-61 runs north and south. I-64 enters from the south and terminates at the interchange. US-40 uses the west and south legs of the interchange. 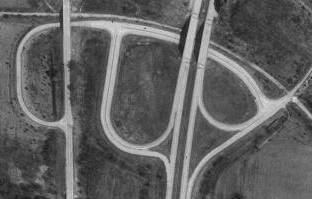 It started as a partial interchange (1st photo), and was converted to the pretzel interchange (2nd photo) because drivers could not make the turns they needed to make. This interchange has since been redone twice more (3rd and 4th photos). These changes converted it into the cloverdirectional interchange (see entry on this below) seen in the 4th photo. This interchange is safer and more efficient. There are no more weaving sections, but there are still two left hand exits. Note, however, that one of those left hand exits is the continuation of US-40. So it is really a main line of travel, and should not be changed. There are no pretzel interchanges left in Indiana. On the other hand, New Jersey is the one place where a driver can find more nonstandard interchanges than anywhere else in the United States, including many pretzel interchanges. 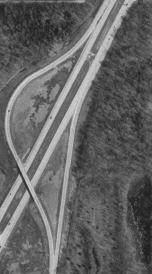 One very interesting pretzel interchange is in Union NJ (inset photo, and see Flyswatter Interchange 6 below). Others in New Jersey are found in or near Little Falls, East Rutherford, Perth Amboy, Columbia, South Bound Brook, Keyport, Trenton, Verga, and Deepwater. There are also many pretzel interchanges in Massachusetts and New York. Where there is relatively low traffic (which is still usually higher than the capacity of a traffic light), and there are no restrictions on room or real estate cost, the diamond interchange is used, because it is the cheapest complete interchange to build. Each entrance or exit consists of a one-way ramp, connected by an acceleration or deceleration lane at the freeway, and an intersection at the crossroad. A diamond interchange is shown at the right. Its name comes from its shape. 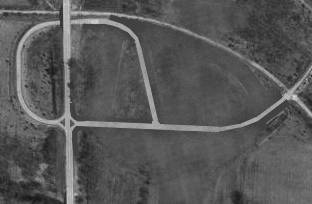 Older rural interchanges were made larger, so cloverleaf loops could be added to them if they were needed later. 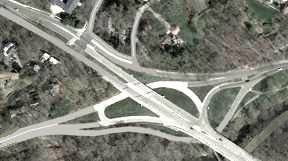 This diamond interchange is a smaller Tight Urban Diamond Interchange (TUDI), and is at the junction of IN-37 (Indiana state route 37 - and future I-69) and IN-48 in Bloomington Indiana. The diamond interchange has two main uses. One is to replace a traffic signal intersection that is overloaded. The other is to provide needed access between Interstate highways and minor roads (since intersections are prohibited by law on Interstate highways). It is the easiest freeway-to-street interchange to build. There are many diamond interchange variations in use. A variant on the diamond interchange has a roundabout (or rotary) at each of the two ramp terminal pairs, instead of intersections. It is called a dumbbell interchange or a dogbone interchange. The roundabouts allow almost continuous flow. A roundabout is a modern continuous-flow intersection where entering traffic must yield to traffic already on the circular one-way road. It is not the old-style traffic circle that caused so many traffic problems in the past. The dumbbell interchange pictured is on the Irish M-1 highway north of Dublin. A variant of the dumbbell interchange with raindrop-shaped center islands in the roundabouts is called a raindrop interchange. The unnecessary parts of the roundabouts are eliminated without changing the flow of traffic within the interchange. The raindrop interchange pictured is on I-70 at Avon Road, in Avon Colorado. There are other diamond interchange variations in use. Another variant of the dumbbell interchange is the large roundabout interchange. Instead of two small roundabouts, this interchange has one large roundabout spanning the freeway on two bridges. The crossroad then connects to the roundabout. Entrance and exit ramps also connect to the roundabout, making a complete interchange. It is sometimes called a table interchange. The almost continuous flow is the major advantage of the large roundabout interchange. The major disadvantage is the cost of building two curved overpasses. This large roundabout interchange is at the junction of US-9 and NY-2 in Latham New York. It was redesigned from an old-style traffic circle to an efficient modern roundabout. This roundabout interchange also has turnbacks on the ramps, because the ramps also connect to frontage roads serving local businesses. A new development is the pinched roundabout interchange. Unlike the circular large roundabout interchange, the pinched roundabout requires only one bridge. This is halfway between the raindrop interchange and the large roundabout interchange. A variation is the rotated pinched roundabout, which reduces the roundabout entry speed and increases the roundabout exit speed. Both of these pinched roundabouts are in Carmel IN. 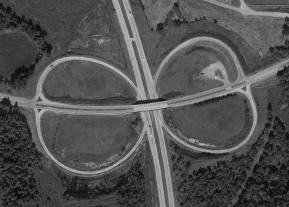 Another variant of the dumbbell interchange is the bow tie interchange. Instead of roundabouts at the ramps, this interchange has only right-turn ramps at the bridge, and uses roundabouts at the next intersections on the cross street in both directions to allow left-turning traffic to turn in the correct direction. The interchange is based on the bow-tie intersection. In this design, left turns are prohibited at the main intersection, and roundabouts are installed at the next intersection on the cross street on each side to provide the missing turns. 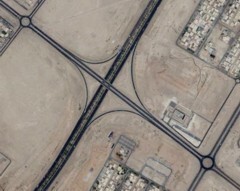 This interchange is in Abu Dhabi UAE. Notice the unusually large distance between the bridge and the roundabouts. Where there is relatively low traffic, and there are no restrictions on room or real estate cost, but a route turns at the interchange, traffic flow is sometimes helped by the use of the Y-diamond or Y-mond interchange, which combines the partial Y interchange (see below) with the rest of the ramps of the diamond, to form a complete interchange. Each entrance or exit again consists of a one-way ramp, connected by an acceleration or deceleration lane at the freeway, and one or two intersections at the crossroad, but the ramps are realigned here to give preference for the turning route. A Y-mond interchange is shown here. The freeway runs from left to right, and the turning route goes from left to bottom. 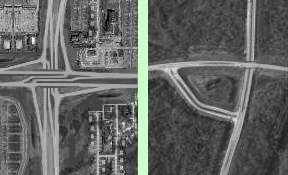 There are only two Y-mond interchanges near Bloomington Indiana, one north of Vincennes, and this one (top photo) found nearby to the west in Illinois, at the junction of US-50 (running left to right), IL-250 (left to bottom), and IL-33 (bottom, ends at the interchange). Notice how neither the traffic on US-50 nor the traffic on IL-250 has to stop at a STOP sign. A frontage road connects to the same intersection the westbound exit ramp (called the odd ramp because its connections vary with the design) uses. Another Y-mond can be found in Chicago Illinois, where Lake Shore Drive meets North Avenue. But the off ramp equivalent to the ramp in the northeast quadrant in the top photo (the odd ramp) connects near the bridge, instead of beyond the curve of the on ramp. Also, the intersections in the Chicago interchange have traffic signals, so the turning route must stop. A mirror image of this interchange also works where the route turns the other way. This type seems to be rarer than the type seen in the top photo. The bottom photo shows a mirror Y-mond where US-35 (freeway) and US-50 (turns at the Y-mond) split southeast of Chillicothe Ohio. This example serves three minor roads and has the odd ramp near the bridge. Where there is relatively low traffic, but either a route turns at the interchange, or there is a restriction that prevents ramps from being built in one or two quadrants, a partial cloverleaf (parclo) interchange is used. It has the function of the diamond interchange, but some of the ramps are bent around so they fit better. This is also sometimes called a folded diamond interchange. Again, acceleration and deceleration lanes are used on the freeway, and intersections are used on the crossroad. Notice in this picture that a shopping center driveway shares the intersection with two of the ramps. If only one quadrant is restricted, the interchange can be a parclo on one side of the freeway and a diamond on the other side. Or if diagonally opposite quadrants are restricted, the parclo ramps can be in diagonally opposite quadrants. And any of these variations can be fitted with dumbbell interchange roundabouts. Often this kind of interchange is built where the crossroad runs parallel to a railroad. The ramps are placed on the side of the road the railroad is NOT on, so the freeway exit ramps do not have to wait on trains. Imagine the back-up and traffic jam on a freeway if an exit ramp becomes blocked by cars waiting for a train to pass? This interchange eliminates that kind of trouble. Another use of this interchange is to gain some distance between interchanges. In the case of the pictured interchange, the distance to the next interchange in the direction of the bottom of the photo can be shorter than it could be with a standard diamond interchange. This is because the ramps begin on the other side of the bridge (in the direction of the top of the photo). This interchange is at the south junction of IN-37 and IN-45 at Bloomington Indiana. IN-37 runs up and down in the picture, and IN-45 comes in from the left and turns at the interchange toward the top of the picture. A shopping center and a low-income housing project block two of the quadrants. Notice that some of the right turns become left turns at the crossroad intersections, and that some of the left turns become right turns. This is always found in parclo interchanges. There is one place where the driver must go straight ahead to go south, turn left to go west, and turn right to go north or east. Try to find it. 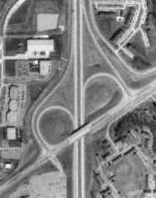 The conversion of IN-37 to I-69 was originally planned to redo this interchange into a split diamond (see below) that also served the crossroad just south of it. But the current design just adds lanes to the existing interchange. Where there is relatively low traffic, and there are restrictions on room or real estate cost, the two-quadrant parclo (or any other interchange) may be "kitbashed" from an existing crossroads when an existing highway is upgraded to expressway status. Again, this is cheap to build, because it uses the existing pavement. A new bridge is built over the expressway, bypassing the existing intersection. Then the intersection is converted into the on and off ramp connections to the expressway. Notice that it is just a twisted around version of the interchange pictured above it. Also notice the S-curves that align the old cross street to the bridge, and the pre-existing buildings fronting on the ramps. Any interchange type can be kitbashed, but traffic must usually flow at reduced speeds on a kitbashed interchange, because of sharp curves. This seems to be the favorite interchange in New Jersey. This one is near Bound Brook NJ, at the junction of US-22 and Somerset County road 525. It is far from an ideal design, but it is cheap to build. Where there is somewhat higher traffic, or real estate prices are higher, a Single Point Urban Interchange (SPUI) is built. It takes less real estate than any other interchange, but the bridges are larger and cost more to build. It still has the basic function of the diamond interchange, but all of the left turns are brought together at a special intersection, usually under the bridge or on it. This allows the left turns from opposite directions to move simultaneously without getting in each other's paths. The traffic signal cycle for the SPUI is simpler and much more efficient than what is possible with traffic signals found on a diamond. Again, acceleration and deceleration lanes are used on the freeway, but here only one intersection is used on the crossroad, in combination with acceleration and deceleration lanes for the right turns. Thus, the SPUI gives us both a higher traffic capacity and a smaller footprint. Both of these are desirable in urban settings. This makes the SPUI quite suited for downtown areas. The first SPUI was built in 1970 at the intersection of US-19 and FL-60 in Clearwater Florida. The SPUI shown is at the junction of I-65 and IN-46, near Columbus Indiana. It is the closest SPUI to Bloomington. One unique feature of this particular SPUI is that the freeway overpasses are suspension bridges, hanging from the arch between the lanes of I-65 (visible in both photos). The top view photo is magnified more than some of the others, so the details of the left turn ramps and the arch are visible. The interchange is actually smaller than any of the cloverleaf interchanges below. 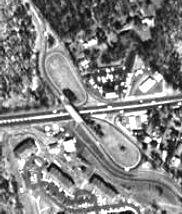 In fact, the site where a cloverleaf loop used to be is visible at the upper right, when a 4-quadrant 5-ramp parclo (see below) used to exist there. This is another of the variety of Diamond Interchange Variations. The very first cloverleaf was built at what are now US-1/US-9 and NJ-35, in Woodbridge Township, New Jersey (top photo). It opened in 1929. Note that it used yield signs at the ends of the ramps, rather than using the weaving lanes we use today. The loop ramps are also the oldest design - the "mouse-ear" loop ramps that require lower speeds instead of the circular ramps used today. It was changed into a 5-ramp parclo (see below) in 2007. The full cloverleaf used to be the choice where both highways had equal traffic and the amount of turning traffic was relatively low. The name of the cloverleaf comes from the 4-leaf-clover shape of the ramps that handle the left turns. Notice how each clover-leaf-shaped loop road produces a left turn by turning to the right for 3/4 of a circle. The driver turns left by continuing to turn right until the car is pointing to what was originally the left. Another way to look at it is in a city street grid where left turns are prohibited. A driver can make a left turn there by driving a block beyond where the wanted turn is, and then making three right turns. But the short (usually 1/4 mile or less) distance between the on ramp of one cloverleaf loop and the off ramp of the next loop causes serious problems. Vehicles leaving the highway have to cross the paths of vehicles that have just entered it, eating up the safe following distances between cars, and slowing down through traffic in the right lane of each highway. 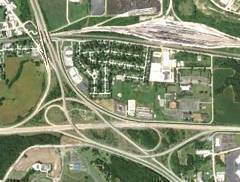 Because these short weaving sections are dangerous, full cloverleaf interchanges are only rarely being built, and existing ones are being converted to either 4-quadrant parclo interchanges or hybrid cloverleaf/directional interchanges (see below). But with collector-distributor (CD) roads paralleling the freeway, the ramps of the full cloverleaf can be connected to them with much less danger, because the speed on the CD road can be set to a lower limit (e.g. 40 mph). The CD roads are connected to the freeway away from the interchange. 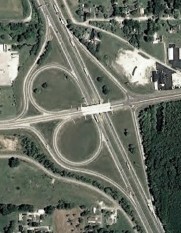 The second cloverleaf pictured at right is at the junction of US-31 and US-24 near Peru Indiana. It is the newest cloverleaf in Indiana, completed in the late 1990s from the remains of an aborted cloverdirectional interchange (see below). 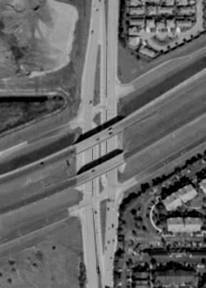 That interchange was started in the 1970s, and was changed into a trumpet interchange (see below) in 1973, when the budget was cut. Since the amount of traffic moving from one highway to the other is relatively low, the cloverleaf works well here. It uses the high speed design, with large circular loops and optimum curves for the outer ramps. 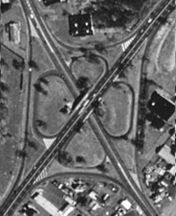 The third cloverleaf pictured is an older design with multiply-curved outer ramps that was on the west side of Indianapolis, where US-40 crosses I-465. It has now been replaced by a 6-ramp parclo interchange (see next item). The cloverleaf at the bottom was east of Richmond VA, where I-64 crosses I-295. Notice how the CD roads protect the high-speed lanes from the entering and exiting traffic. A directional ramp has since been added for turns from southbound to eastbound, making a cloverdirectional interchange (see below). Another example of a use for CD roads. On the one shown here, the freeway exits are like diamond interchange ramps, ending in right-angle intersections. The entrances are cloverleaf interchange ramps, but without the presence of the dangerous weaving of exiting and entering traffic. This 4-quadrant parclo is at the junction of I-465 and US-40 on the west side of Indianapolis IN (replaced the cloverleaf interchange that was here in 2010 - see above). Notice that, although the crossroad in this picture is at an oblique angle, this is not usually the case with this type of interchange. Note also that this version of the interchange is not quite as efficient as its mirror-image twin (below). Each traffic signal on this interchange must stop traffic in both directions. The mirror-image version does not have this limitation. On the mirror-image version of the 4-quadrant 6-ramp parclo, the freeway exits are like cloverleaf interchange exit ramps, with separate exits for right and left turns. Again, the dangerous weaving sections are gone, because the entrances are like diamond interchange ramps. This interchange is in Bloomington Indiana, at the interchange of IN-37 (running north and south), IN-46 (running east to west), and IN-45 (turns at the interchange, using the east and south legs). I-69 will use it (unmodified) when it is completed through the area on the route of IN-37. The extra-long ramp on the left side of the photo was necessary to avoid having to cut through a large formation of limestone. The ramp was built on top of it and is much higher than mainline IN-46. It handles our football stadium after-game traffic with no aid from the police. The stadium is several blocks to the right of the edge of this photo. The problem with this particular interchange used to be that a traffic light was located just out of the picture to the south, very close to the bottom of the photo. Often the queue backing up from this traffic light interfered with the merge seen at the bottom of the photo. An overpass without access ramps has now replaced that traffic light as part of the I-69 construction. On the other hand, there is a traffic light within the interchange where IN-45 makes its left turn (near center of picture). The traffic heading westbound also has a set of signals, but unless the intersection is set for flashing operation for some reason, those westbound lights always stay green. Traffic making the other left turn off the bridge is light, and is controlled by only the left turn rule. This is the distinct advantage of this version of the 6-ramp parclo, because each traffic signal on this interchange needs to stop only one direction of cross-street traffic. Such "half signals" fit perfectly into any possible signal progression plan. A third version of the 4-quadrant 6-ramp parclo has a loop entering one direction of the freeway and a loop exiting the other direction of the freeway. 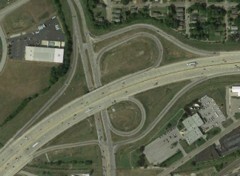 This interchange is in Indianapolis Indiana, at the interchange of I-70 (running east and west) and Rural Street. It has the disadvantage or a weaving section on the crossroad, in this case in the northbound lanes. This is not as dangerous as such a section on the freeway would be, because the speed limit is much lower. If there are traffic signals at the diamond ramps, the one on the exit ramp must stop traffic in both directions. But the one on the entrance ramp needs to stop only the traffic the left turn crosses. A fourth version of the 4-quadrant 6-ramp parclo has loops exiting and entering one direction of the freeway and no loops on the other direction of the freeway. This interchange is in Austin Indiana, at the interchange of I-65 (running north and south) and IN-256 (running east to west). It has the disadvantage or a weaving section on the freeway, in this case in the southbound lanes. This is safe only if the loop ramp traffic is light, or of only one of the loop ramps has heavy traffic at any one time. If traffic lights are needed, only one signal is needed at the intersection where the diamond ramps meet the crossroad. There are also 5-ramp versions of parclos, where only one cloverleaf loop is used. 7-ramp versions also exist. The loop of the 5-ramp version can be either an entrance (loop-on, left) or an exit (loop-off, right). The half of the interchange across the freeway from the loop is just like a diamond interchange in this case. This interchange is used where only one left turn is heavily used. This interchange (left) is at the west crossing of I-465 with 38th Street in Indianapolis IN. 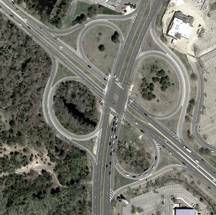 It started as a diamond interchange, and it has recently been modified to become a 6-ramp loops-on parclo. 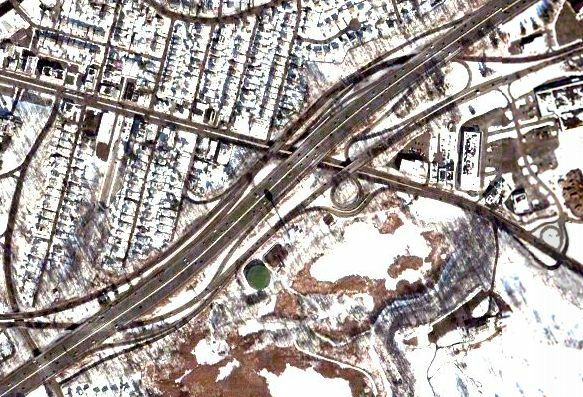 The very first cloverleaf interchange, at US-1/US-9 and NJ-35 in New Jersey (above), was converted into this (mirror image) 4-quadrant 5-ramp loop-off parclo interchange in 2007 (right). 4-quadrant 7-ramp designs are also used. Where a business route leaves the main highway at each end of a town and re-enters the same highway at the other end of town, the partial Y interchange is used at each end, with the ramps connecting the business route to the freeway leg away from the town. If another route comes to the freeway at the same point as the business route, then either a diamond interchange or a y-mond interchange is used (see above). 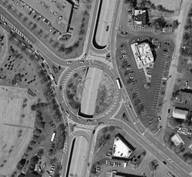 Partial interchanges are also used on toll roads, to insure that all traffic goes through at least one tollgate. This partial Y is at the interchange of IN-37 and North Walnut Street, north of Bloomington. The exit signs say College Avenue, because that is what the southbound street of the one-way pair is named after the road splits into two one-way streets. The problem with an isolated partial Y interchange is that drivers who are using road maps that show interchanges as little squares often approach the interchange intending to make one of the turns for which there are no ramps. This causes those drivers to either make illegal turns or go miles out of their way. That's why federal highway policy now discourages partial interchanges. In this case, the turn needed to access North Walnut Street is the IN-45/46 exit (shown above), which is almost 4 miles to the south. A driver who missed that exit can't make the turn. 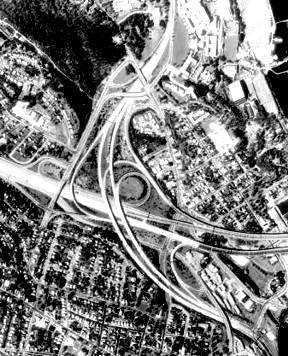 Worse is the incomplete trumpet interchange (lower left - see trumpet interchange entry below). It is missing only one ramp, and is an obvious attempt to cut corners when budgeting a project. The missing ramp is always one that requires either a wider bridge or a second bridge. Again, it causes drivers to either make illegal turns or go miles out of their way. This incomplete trumpet is south of Bedford IN, where the new route of US-50 and IN-37 meets the old road they used to follow. Vehicles unable to make the missing turn make U-turns at the next intersection to the left, just out of the photo. The pelican interchange is one result of converting a partial Y interchange or an incomplete trumpet into a complete interchange by adding the missing ramps. The name comes from the new ramp being shaped like the beak of a pelican. This pelican interchange is south of Detroit Michigan, where I-275 meets I-75. Where there is relatively low traffic, and there are no restrictions on room or real estate cost, but the interchange is too close to another interchange on one side, the partial diamond interchange is used. The ramps service only to and from the direction away from the close interchange. Surface streets are used to reach the close interchange to gain access in the other direction. This partial interchange is also used on toll roads to force traffic to pass through a main route tollgate before it encounters any exit ramps. Again, federal highway policy now discourages partial interchanges. This partial interchange is at the crossing of I-465 and Mann Road, on the south side of Indianapolis IN. Just west of it, and too close for Mann to have a full complement of ramps, is the southwest junction of I-465 with IN-67. But the road going off to the left south of the freeway goes over to a traffic light on IN-67. Where the side road exists on only one side of the freeway, and traffic is relatively low, the trumpet interchange is used. Each entrance and exit consists of acceleration or deceleration lanes at each end. In the application shown here, the trumpet interchange is used to connect a toll road to a highway, with the trumpet feeding the access road, which goes through the tollgates to get to the other highway at the intersection. But it can also be used at a single side road without the tollgate or intersection. It is called a trumpet interchange because the shape of the ramps on the side of the freeway away from the side road looks like the bell of a trumpet. This trumpet toll-road interchange (far right) is at the junction of the Indiana Toll Road (I-80 and I-90) and US-12, near Michigan City Indiana. It is the best available example of a toll-road interchange. The closest trumpet to Bloomington (inset) is at the junction of IN-37 and I-69 south of Bloomington. I-69 runs north and south in the photo (top to bottom). IN-37 runs from the top to the lower right. This interchanges is unusual because it has two bridges and a wider "bell" for higher speed on the lower bridge. (Could it be a tuba???). This trumpet has a relative size of 2. Where a toll road connects to another freeway or toll road, a double trumpet interchange is used, so all of the ramps meet at the same set of tollgates. In this example, the toll road runs from left to right. There are two extra ramps at the bottom of the picture which are not normally part of the double trumpet, but which here provide access from local roads to the toll road (and also provide the way the toll takers drive to work). This double trumpet is where the Indiana Toll Road (I-80 and I-90) meets I-69 near Angola Indiana. Indiana started out with 4 simple double trumpets, but three of them had extra ramps added to connect to other roads. The fourth had one of the trumpets removed and replaced with an intersection, becoming a single-trumpet toll-road interchange. There is a quadruple trumpet interchange at the junction of I-90, I-91, and US-5, connecting Holyoke and Chicopee Massachusetts together. Three of the trumpets connect the highways to the ramp system, and the fourth connects the ramp system together. I-90 is a toll road. Where a toll road connects to a highway, traffic flow is relatively low, and a tollgate is needed for the mainline flow on the toll road, the butterfly interchange is used. Note that the butterfly interchange is a diamond interchange folded back on itself. The weaving section under the bridge would be a serious hazard, except that the tollgates themselves are also under the bridge. Every driver must stop to pay the toll. This makes the arrangement safe. But it is not safe with electronic toll collection. In this example in Sebree KY, the toll road (Kentucky's Pennyrile Parkway KY 9004) runs north and south. The crossroad is KY-56. When the parkway became free and the tollgates were removed, stop or yield signs were added to the on ramps to make the interchange safe. When the Pennyrile Parkway became I-69, this interchange was replaced with a diamond interchange. Notice the driveway and parking lot inside one of the loop ramps. Almost all butterfly interchanges have these. They are parking lots for the toll takers to park their cars while they are working. 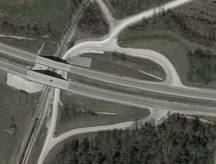 The butterfly interchange is one of the smallest interchanges known. 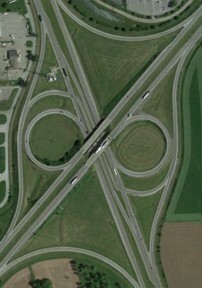 The inset image is a folded butterfly interchange. 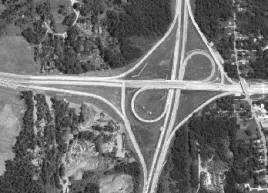 It works similarly to the butterfly interchange except that they built the tollgate away from the bridge. It has the same disadvantages the butterfly interchange has. This one is on the Kentucky Blue Grass Parkway at KY-52 near Boston KY. It has a relative size of 1.0. Where there is high traffic, or where one freeway connects to another, a directional interchange is used. This is the most expensive kind of interchange to build, mostly because of the multiple bridges. Each traffic movement has its own ramp, with its own diverge lanes and merge lanes, and often a high-speed roadway along its length. Many directional interchanges require no reduction in speed for motorists going in any direction. There are several different kinds of directional interchange ramps. Usually the left turn* ramps are categorized according to the path they take through the interchange. The table at right shows the different kinds. A directional ramp is a left-turn* ramp with no intersections that is not just a loop ramp. The main bridges are the bridges where the two freeways cross each other. Usually directional ramps can carry much more traffic than other kinds of ramps. The pelican and looped directional ramps usually need lower speeds. An indirect diamond ramp is a left-turn* ramp with an intersection at one end that is not just a diamond ramp. Flip any directional ramp image along the indicated diagonal to see the reversed directional ramp (inset). To see larger versions of these images, right click on the image, select View Image, and use ctrl+ to enlarge it. * In countries that drive on the right. Trade left and right in the texts for countries that drive on the left. Directional General ramp: no intersections; not loop ALL ? ? Crossover Left of main bridges of both freeways ? ? Indirect Directional that is not crossover or direct ANY ? ? Here is a 3-level Y stack interchange. Each left turning ramp is bridged over or under the other two, so there is a 3-level structure in the middle. A multiple level structure is called a stack. This directional stack interchange is in Vincennes Indiana, at the east junction of US-50 and US-41. Directional interchanges are named for their function, not their shape. Directional interchanges can also have 4 levels of overpass for 4 directions. This is also a stack interchange. Stack ramps cross each other in nearly the same place, causing the overpasses to have multiple levels. Note how the left turns coming from opposite directions are on the same level of the stack. This stack interchange is the original prototype of its kind, in Los Angeles California. It is at the junction of US-101 and CA-110 (previously I-110). The closest stack to Bloomington is in Dayton Ohio, but it has two minor interchanges embedded inside the area of the stack, so it is not a good example of a stack for use on this page. Since the curves in this particular stack have smaller radii, the ramp speeds for the left turn movements are reduced to 40 MPH. The stack is not the only kind of directional interchange. The overpasses don't have to be in the same place. These ramps are called indirect directional ramps, and the interchange is a turbine interchange. Turbine interchanges make all of the left-turning traffic circle around the central bridges (where the freeways cross) in a counterclockwise direction. This turbine interchange is just east of Tampa Florida, where I-4 crosses I-75. Notice how all movements can be completed at high speed. But it was very expensive to build, as I count 17 bridges (and that does not count the bridges over minor streets that are also visible). The downtown Chicago Spaghettibowl Interchange is a turbine interchange (but it is being altered to change some ramps to multilane stack ramps). The left turn ramps of a directional interchange can have many different shapes and configurations. An interchange with several different kinds of directional ramps is called a directional interchange. A directional ramp that takes the left turn to the left of the point where the two freeways cross each other is called a crossover ramp. Crossover ramps are usually able to handle higher speeds than any other kind of left turn ramp can handle. On newer interchanges, except where a major route makes a turn, the left turn ramps are designed so that they exit one main road on the right, and enter the other main road on the right. Notice how this crossover interchange is built with all ramps exiting and entering on the right. The top pictured interchange is a new crossover interchange west of Houston Texas where I-10 meets TX-8. This is one of the most expensive kinds of interchange to build, because it contains either 24 separate bridges, or long continuous bridges. But all of the exits and entrances are on the right side of the freeway. They have added frontage road bridges to this interchange since the photo was taken. Older crossover interchanges were not made using this constraint. The left turn exit ramps were on the left, and the left turn ramps entered on the left, causing turning traffic to interfere with the fastest traffic using the main roads. This kind of interchange is no longer being made. 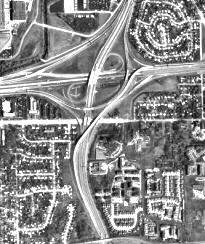 The older crossover interchange pictured here in the center photo is in downtown Detroit Michigan. It connects I-94 and MI-10. All of the left turns exit and enter on the left. But it has only 16 bridges. An interesting variation of the crossover interchange is the braided crossover interchange. In this variation, the main highway lanes cross each other with overpasses. This used only 8 bridges, instead of the 16 bridges needed for the old style crossover interchange, and the 24 bridges on the new crossover interchange design. But the bridges are wider, and this design also has the problem of left side exits and entrances. So these are no longer being constructed. 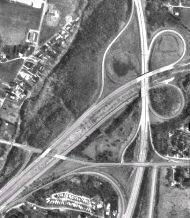 This braided crossover interchange (bottom) used to be at the junction of I-95 and I-695 northeast of Baltimore Maryland. It has since been converted into a stack interchange (above). Where an Interstate highway route turns at an interchange, the old style crossover ramps are still being used, even for right turns. This places the high speed lanes of the interstate route on the left side, since most of the traffic follows the turning route. The normally straight ahead movements on such interchanges exit on the right. Interchanges parts from several different interchanges can be combined into one interchange, as in this hybrid half-cloverleaf-half-directional interchange. The dominant left turns use the directional ramps. Alternate names for different hybrid interchange types are cloverdirectional, cloverstack, clovercrossover, and cloverturbine. A cloverdirectional interchange is shown in the second photo at the very top of this page. 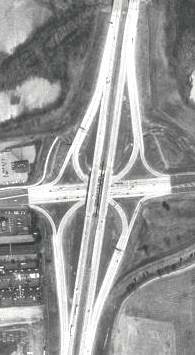 The interchange shown here was in Indianapolis Indiana, at the eastern junction of I-70 and I-465. It contains one turbine directional ramp, one crossover directional ramp, and two cloverleaf loops. The cloverleaf loop in the lower left quadrant has since been converted into another turbine directional ramp. Now the reader can see how they choose among the various kinds of interchanges. But even more interchanges can be designed from the basic parts we have seen. There are special kinds of interchanges that are fitted to special conditions. These are quite numerous and so all of them cannot be shown here. One of these special circumstances is where a freeway crosses a major river with a bridge or a tunnel, and connects to a freeway or a crossroad running parallel to the river. Here, the ramps have unusual shapes to avoid the river itself. Most famous bridges and tunnels in the US have unusual interchanges at their approaches, including the George Washington Bridge, the Lincoln Tunnel, the Holland Tunnel, and the Brooklyn Bridge, all in New York City. These ramp layouts are necessary to get traffic onto the bridge or tunnel, even though that structure is at a very different grade than the surrounding terrain is at. This is done so that large ships can pass underneath the bridge or over the tunnel. This "bent paperclip" interchange is at the crossing of I-5 with OR-99, in Portland Oregon. The Columbia River is visible as a row of dockhouses at the top. This one is functionally the same as a SPUI, except that some of the right and left turns have traded places. (Could it be a SPUPCLO - Single Point Urban Partial Cloverleaf?) The white trail following one of the ramps is a sidewalk passing under the river bridge. Another special circumstance is where more than two freeways come together in one interchange. In order for it to be complete, it must be rather large. The largest interchange I know of is near Chicago, in Hillside Illinois. I-88, I-290, I-294, US-20, IL-38, IL-56, IL-64, and local streets all come together in one 5-mile-long swirl of roads and ramps. The locals call it the "Hillside Strangler" because there was one point on I-290 that was always jammed up (until they fixed it). It consists of many partial interchanges, but as a whole, it is complete. I-294 (the Tri-State Tollway) runs north and south (vertically) in the center of the photo. I-88 (Ronald Reagan Tollway, formerly the East-West Tollway) runs to the left near the bottom of the photo. I-290 (Dwight D. Eisenhower Expressway) runs from the top left of the photo down and to the right, leaving the photo at center right. US-20 (Lake Street) is the diagonal road at the top right, and reappears at the extreme top left after following I-290. IL-64 (north Avenue) is the horizontal road at nearest the top. The horizontal road a third of the way from the top is St Charles Road. The diagonal road in the very middle, without any ramps, and slanting east by northeast, is IL-56 (Butterfield Road), and the road just south of that is IL-38 (Roosevelt Road). The horizontal road near the bottom is Cermak Road. The vertical road on the left side is York Road, and the vertical road on the right is Wolf Road. The short vertical road to the right of the Tollway is Taft Avenue. Note also that the interchange has been fitted around at least three railroads and a rail yard. There are ramps that connect all of the freeways and toll roads to each other directly. Some are at the very top and very bottom of the picture. But many of the contained interchanges to surface streets are partial interchanges, intended to make traffic pass through the tollgates. The missing turns can be made by exiting at the wrong surface street, and then using the surface streets to get to the correct street. In a likewise manner, drivers on any surface street can use other surface streets to enter any of the freeways and toll roads in any direction. So overall, it is a complete interchange. A very common special circumstance is where several roads need to be connected to the same freeway, but they are too close together. Two kinds of interchanges are used here. One is the split diamond interchange. This is where, instead of servicing one crossroad, the diamond ramps intersect two or more crossroads before returning to the freeway. Motorists can go straight through one intersection and turn at another, accessing all of the crossroads equally. The split diamond is often used where the two crossroads make a pair of one-way streets. 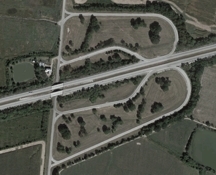 Parclo interchanges can be split too. This split diamond photo is a composite image. Do not confuse the split diamond interchange with a bifurcated diamond. A bifurcated diamond has two half diamonds placed a block or two apart, but without direct ramps connecting them together. A variant of the split diamond is the multileg roundabout interchange. Instead of two parallel streets on the bridges, a large roundabout crosses them, spanning the freeway. Several crossroads then connect to the roundabout. This is sometimes called a table interchange. This 6-way roundabout interchange is in Dedham Massachusetts, at the place where I-95, US-1, and MA-128 bypass interchanges with East Street, Canton Street, and Allied Drive. One odd feature of this interchange is that the northbound lanes of I-95 are the southbound lanes of US-1, and vice versa. The other interchange used for multiple crossroads is the rebound interchange. Here, the eastern (right) crossroad has a full diamond interchange. The western (left) crossroad is connected by the rebound interchange ramps to the ramps of the diamond interchange as shown here. The road on the west actually has full access to the freeway! It can access the freeway directly to and from the east by using the ramps that cross the eastern crossroad. Access to and from the west is provided by using the ramp going eastbound to get to the eastern crossroad, making two left turns (the rebound), and then heading west onto the desired ramp. This rebound interchange is on I-30 (the Tom Landry Highway) in Dallas TX. The eastern crossroad is Cockrell Hill Road, and the western (rebound) crossroad is Chalk Hill Road. Rebound interchanges can also be attached to parclo interchanges, volleyball interchanges (see below), or split diamond interchanges. An interchange may have one rebound interchange on each side of its bridge. And with Collector-Distributor roads, rebound interchanges can be connected to a variety of interchanges, as long as a place to turn around from one CD road to the other is provided to provide the rebound function. Two rebound interchanges can be connected to form a double rebound interchange, with the freeway on and off ramps connecting directly to the rebound ramps between the bridges. Because I have never found a pure double rebound interchange without other attachments, the one shown here is a composite image made from the upper one. This is another of the Diamond Interchange Variations in use. Example of rebound interchanges with CD roads. Two freeways can meet at a form of the split diamond interchange where each freeway's ramps are the one-way crossroads for the ramps of the other freeway. In the picture at right, it is just like the split diamond above, except another freeway runs north and south. The ramps of each freeway are like the crossroads of a split diamond to the other set of ramps. This is called a volleyball interchange (or a 3-level split diamond). The name might come from the pattern of lines on a volleyball, or from the path a left-turning car takes that looks like a volleyball play. This is also a composite image. 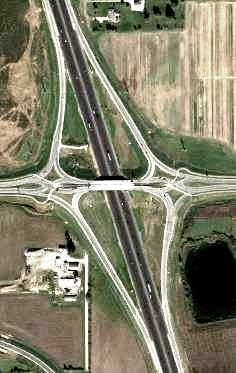 Unfortunately, I can't find a good image of a volleyball interchange, because most volleyball interchanges have intersections, diamond interchanges, rebound interchanges, or collector-distributor roads attached to their ramps. A roundabout can be substituted for the crossed ramps, making a three level roundabout interchange. Such interchanges are much more common in Europe than in the US. A new version of the diamond interchange is the diverging diamond (DDI), also called a Double Crossover Diamond (DCD). The main roadways of the cross street are braided. They cross each other at the two signalized intersections in the interchange. None of the ramps have signals in the simplest version. Traffic on the cross-street bridge drives to the left of the center divider. This is a cheaper alternative to the SPUI (see above), because the bridge is not nearly as expensive to build. Another advantage is that all signals are two-phase. One problem with the design is the left-hand entrance for traffic turning left onto the cross street, followed by a weaving section. But the slow speeds on the cross street should keep this from being a hazard. If necessary, the same two-phase signal can control the ramps to get rid of the weaving. Three DDIs were built in France in the 1970s. But no more of them were built until 2009, when the first DDI in the US was opened in Springfield MO. There are now more than 80 of these interchanges open to traffic in the US. This DDI is at I-65 and Worthsville Road, southeast of Greenwood IN. The thin white lines are sidewalks and crosswalks. This is another of the Diamond Interchange Variations in use. See the signal phasing at this link. Another version of the diamond interchange is the contraflow left (CFL) diamond. The main roadways of the cross street are not braided, but the left turn lanes are. The left turn lanes don't cross each other. Each left turn lane passes left of the end of the other left-turn lane. The contraflow left interchange eliminates left turn storage limitations for traffic turning left from the cross street. This means that lagging left turns can be used on both traffic signals, rather than using the more complex diamond interchange sequence. But it does not eliminate left turn storage problems for traffic exiting the freeway. This contraflow left interchange is where FL-869 crosses Lyons Avenue in Coconut Creek Florida. Notice how the left turns separate from other traffic well before the ramp intersections. The left turn lanes pass to the left of the center divider, and curve to the left where they enter the ramps. Another contraflow left interchange is where VA-168 (Tidewater Drive) crosses VA-165 (Little Creek Road) in Norfolk Virginia. In this case, the ramp intersections are so close together that they are operated as a common intersection (as in a SPUI). But the exit ramps have split phase operation (each ramp has its green alone) to keep the left turns from getting locked together. Another interchange (inset) is functionally identical to the above interchange, except for the locations of where the left turns cross oncoming traffic, and that the bridge is wider to support the left turns. This interchange is in Abu Dhabi UAE. The CFL is another of the Diamond Interchange Variations in use. See the signal phasing at this link. All of these interchanges are complete. This at-grade cloverleaf (top) at twp-549 Hooper Ave (vertical) and twp-571 Bay Ave (diagonal) in Toms River NJ is just like a standard cloverleaf except for one thing: Instead of a bridge where the two highways cross, there is a traffic light. All turns are made using the ramps. The echelon interchange is mainly designed to separate traffic movements, make all signals 2-phase, and improve signal progression on one or both streets. 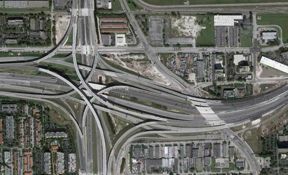 Only one echelon interchange has been attempted (in Florida), and it is not a true echelon interchange. Since no echelon interchange actually exists, the images (bottom left and bottom center) are artist's conceptions. Each level handles one direction of thru travel on each street. All of the signals have only two traffic phases. For progression purposes, each signal controls one-way traffic. Special ramps or lanes handle two right turns and two left turns. In the left photo, extra ramps are provided for right turns and U-turns. In the center photo, those right turns go past the overpasses and turn at the main intersection. Thus, this version is more compact. It is the minimal complete echelon interchange and is totally symmetrical. One problem with both versions is the left-hand merge from the special ramps and lanes. The windmill interchange (bottom right) has all traffic exiting by ramps and entering at intersections. The only known windmill interchange is where US-35 (from upper left to lower right) crosses OH-32 and OH-124 (from lower left to upper right) near Jackson Ohio. The 2-level signalized intersection (top left) is a mirror image of the windmill interchange (see above). But one difference is that each traffic signal stops only one direction of straight-ahead traffic. This allows each signal to be set for optimum timing for progression. Since no such interchange yet exists, this image is an artist's conception. Note that this one also has contraflow-left turns (see above) on both roads. The single quadrant interchange (top right) keeps straight ahead traffic from conflicting with all other straight ahead traffic. Only traffic turning from one highway to the other must use the ramps. Most of these interchanges have stop signs on the ends of the ramps (but thru movements don't have to stop). 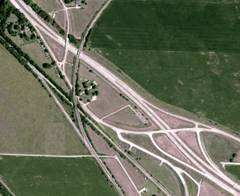 This interchange is where US-50 (horizontal) crosses IL-1 (vertical) north of Lawrenceville Illinois. 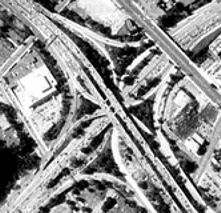 Most single quadrant interchanges were intended to be that way or were necessary because of a difference in the heights of the roads. But a change in plans changed this interchange and the next interchange west, a kitbashed trumpet (bottom left) at IL-250. The IL-1 interchange was to be a 2-quadrant parclo (see above), and the IL-250 interchange was to be a trumpet (see above). This highway was supposed to be Interstate 64. But after construction had started, a senator from Evansville IN wanted Interstate 64 moved south from Vincennes to Evansville. The contractor came up with two plans, one to use if I-64 moved, and the other if it didn't. He built the elements common to both sets of plans (one 2-lane highway with 2-lane overpasses) before the decision was made. 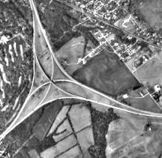 When they decided to move I-64, he built a 2-lane expressway, the single quadrant interchange, and the kitbashed trumpet, to be expandable later if needed. On the kitbashed trumpet, traffic going either way on US-50 turns right for IL-250. Traffic from IL 250 (lower right) uses the two-way ramp under the bridge and turns either way onto US-50 at the end of the ramp. A local road uses the second ramp space under the bridge. 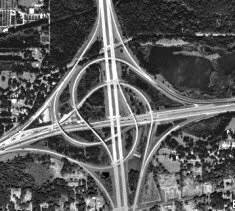 This could be a flyswatter interchange (see below). A mirror image of this interchange is at Raymond Street and West Street (below). The College Station TX interchange (bottom right) is an enigma. There are two different ways to make two of the left turns from TX-2818 (top left to bottom right) onto TX-60 (top right to bottom left). It is a hybrid of a diamond interchange and the 2-level interchange mentioned above. Why was this made this way? Maybe it was for college students who can't understand turning right to go left. It could also be a flyswatter interchange (see below). At the original intersection, left turns backed up when Lake Monroe opened. Adding ramps make all turns on IN-37 right turns, using the existing overpass over the railroad. When new IN-37 was built, the design was retained, overpassing both railroad and road. The next photo (row 2 right) is where they fixed left turn backups at old IN-66 (Yankeetown) by using the railroad underpass. They kept it when IN-66 later became a divided highway. 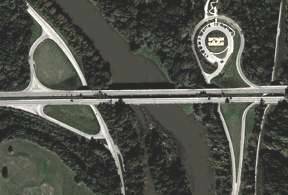 The 38th St White River bridge (Indianapolis, row 3 left) provides two White River Parkway (E Dr & W Dr) interchanges and room for a large sculpture and parking inside the curve of one ramp. More sculptures are on walkways north of the ramp. Old 37 (vertical) crosses a stream (Bloomington, row 3 right) with two single-quadrant ramps for Smithville and Ketcham Roads. IN-64 bridging the valley for Bird Hollow Creek (English, row 4 left) has ramps for IN 37. Raymond St (Indianapolis, row 4 right) bridges the White River, a railroad, and a kitbashed trumpet connecting Raymond to West St.
Rock Creek, in Rock Creek Park (Washington DC, row 5), requires bridges that provide for this interchange between Klingle Rd (lower left and lower right), Porter Rd, (upper left), a Beach Drive connection (upper right), and some residential streets (top). 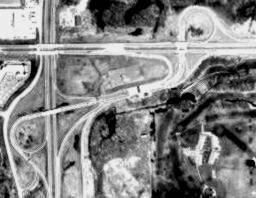 It started as a partial Y and grew into a non-freeway interchange with intersections on both roads. Beach drive follows Rock Creek, passing under the other side of the bridge (lower right). Klingle to the left of the interchange was closed after it washed out in 1991. Environmentalists prevented it from being rebuilt. It serves one residential street west of the interchange and then ends, making three major ramps on the interchange mostly useless. The divider on the topmost ramp separates the one-way ramp from a two-way portion of Porter going to a residential street. 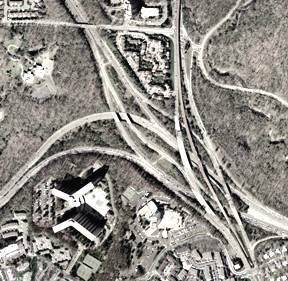 Rock Creek, in Rock Creek Park (Washington DC, row 6) also provided bridges used by the interchange (left) connecting Military Rd (horizontal expressway) to Ross Drive (bottom left) and Joyce Rd (from the interchange to center top, passing under Military). The missing on-ramp to Military is provided as a rebound ramp using Missouri Ave at the 16th St NW interchange (top right). Beach Drive follows Rock Creek from top left to center bottom, intersecting Joyce Rd. 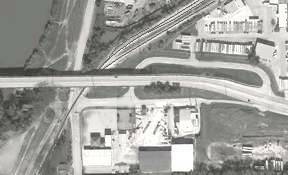 The kitbashed cloverleaf (Indianapolis, next item below) has one street already low for a railroad underpass (left). This required a wanted overpass when Madison expressway was built. Surface streets were already available for ramps. Last, but not least, is the "flyswatter interchange." This is where the engineers seem to have taken some interchange parts, thrown them on the map, and then went SPLAT with a flyswatter. They make people want to shout, "Who did that?" Flyswatter interchanges don't make much sense. Most of them seem to have evolved by themselves, rather than having been carefully planned. Many times the flyswatter interchange results when a new feature is patched into existing roads. Other times it happens when some landmark must be saved, when intervening terrain must be avoided, or when a project is abandoned or delayed after part of it is constructed. And in many cases, existing streets serve as interchange ramps (right - six of the eight ramps - kitbashed cloverleaf in Indianapolis). 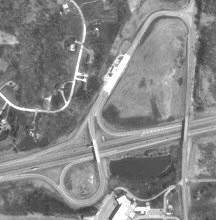 This first example of a flyswatter interchange is in New London CT. The freeway running east and west is I-95. CT-32 runs north and south as the divided highway curving through the interchange, being Mohegan Ave north of the interchange, and Eugene O'Neill Drive south of it. US-1 follows I-95 to the east, and CT-32 to the south. CT-636 (Briggs Street) is the north-south street running west of CT-32. The diagonal street east of CT-32 is CT-635 (Williams St), and the street exiting from I-95 and running just south of it (crossing O'Neill twice) is CT-641 (Huntington St). Note that the main interchange has ramps for three left turns, but only two right turns. There is a major river bridge on I-95 to the east, and all of the connections for the bridge itself are provided, as are the connections for US-1. So this was intended to be a bridge interchange. Notice that two of the missing turns can be made by using Briggs St. The remaining missing turn must be made using Huntington Street, along with any cross street south of the edge of the photo (e.g. State Street). The second example of a flyswatter interchange is the Pook's Hill interchange on the Capital Beltway near Chevy Chase MD. The freeway running east and west is I-495 (the Capital Beltway). I-270 enters at the top left, and MD-355 runs north and south as the divided highway running through the interchange. Grosvenor Lane runs across the top of the picture on the left side. Pook's Hill Road is the curved road at the bottom of the picture. The bridge running between the lanes of MD-355 is a pair of light rail tracks. This interchange was born missing half of its ramps. Traffic exiting the Beltway could make right turns onto MD-355, but not left turns. Motorists on MD-355 could make left turns onto the beltway, but not right turns. Traffic on southbound MD-355 couldn't turn onto I-270, and traffic on I-270 couldn't turn onto northbound MD-355. The missing connections between I-270 and the Beltway are taken care of at two other interchanges. A jughandle left turn ramp was added to the turn from northbound MD-355 onto Grosvenor Lane. This provides a way for drivers to make U-turns. Thus, drivers on northbound MD-355 can go east on the Beltway, and drivers exiting the westbound Beltway can go south on MD-355. A second U-turn point at Pook's Hill Road was abandoned, because it was too close to the ramps. It caused serious weaving conflicts. A ramp was added from northbound MD-355 to go east on the Beltway. This removed some of the traffic from the jughandle. Eastbound traffic on the Beltway and eastbound traffic on I-270 are directed to turn off onto northbound MD-187 (Old Georgetown Road) to get to northbound MD-355. Traffic on southbound MD-355 are told to turn onto southbound MD-187 to go west on the Beltway or I-270. The third example of a flyswatter interchange is the interchange of FL-826 (Palmetto Expressway - vertical) and FL-836 (Dolphin Expressway - horizontal) in Flagami Florida. The westbound to southbound turn is provided twice, but no northbound to westbound turn is provided. Why? This interchange was a symmetrical cloverdirectional interchange. A new crossover ramp was added to it (the lightest pavement in the photo). Ramp stubs, visible changes on the signs, and foliage patterns indicate that the missing directional ramp was removed. Why? A kludge provides the missing movement. Signs direct northbound drivers wanting to turn west to turn east instead. Then, at the next interchange (right side of photo), the signs tell these drivers to exit onto the loop ramp, and then re-enter westbound using the other loop ramp. This is the reason this is a flyswatter interchange. Apparently the missing ramp was removed to make room for the new crossover ramp. From the design of the new ramp, the original loop ramp was probably overloaded. The loop ramp has a vertical clearance restriction (posted on the signs) that the new ramp removes. The old loop lets drivers take an exit south of the interchange. The new ramp bypasses it. 2016 update: This was replaced by a stack interchange with full access in 2015. The new crossover ramp was stage 1 in the building of the stack interchange, and is part of it. The fourth example of a flyswatter interchange is at the intersection of I-75 and US-30 near Beaverdam Ohio. The original interchange was a simple diamond interchange east of Beaverdam. Interstate 75 runs north and south in the interchange (small picture, upper left). Old US-30 runs east and west. It was a 2-lane road with turn lanes at the interchange. In stage 2, a new 4-lane US-30 freeway was built as far as Beaverdam (picture upper right). It crosses I-75 west of the interchange without any ramps, and then joins the old US-30 just east of the I-75 interchange. A future US-30 was intended to continue at the upper right. Old US-30 comes in from the left, and US-30 leaves to the right. The new interchange, intended to be a diamond in the future, was built as a half diamond with a directional ramp carrying westbound US-30 under the old route. It was intended that this temporary directional ramp, then no longer needed, would be removed when the 4-lane US-30 was completed. The interchange remained like this for over 25 years. 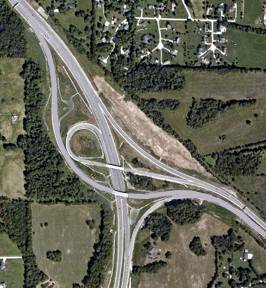 Why was no direct interchange made between I-75 and the new US-30? In the lower left corner of the bottom photo at right (where US-30 overpasses I-75), a railroad is visible running parallel to I-75 (as it did along the old US-25 that I-75 uses the path of). This railroad prevented any ramps from being installed for the southbound direction of I-75. A direct interchange would have required relocating I-75 farther to the east. 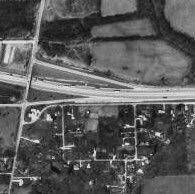 So it was originally intended that a short section of old US-30 be used to connect the two diamond interchanges together. The resulting function of the interchange would have been roughly equivalent to that of a volleyball interchange. When the new US-30 was finally built in the 1990s, the route was changed to run south of the old US-30 instead of north of it as originally planned. This necessitated a redesign of the interchange between US-30 and old US-30. The original partial diamond, including the overpass and directional ramp, was demolished. A modified trumpet interchange was built south of old US-30, and was connected to old US-30 at an intersection. Note that only traffic turning from I-75 to US-30, traffic turning from US-30 to I-75, and traffic going to or from Beaverdam needs to use old US-30. Also note that the ramps to and from eastbound US-30 are left hand ramps. The fifth example of a flyswatter interchange is where US 30, US-250, OH-3, and OH-83, come together near Wooster Ohio. US-30 goes from the bottom left to the right side near the bottom. A future US-30 will leave at the upper right. Old US-30 comes in from the left. US-250 runs from the bottom left to the bottom. OH-83 goes from the top to the bottom - the only straight route on the page. OH-3 runs from the top to follow US 30 to the lower left. The road leaving at the right of the bottom edge is a local street, not a ramp. It was like this for 20 years. Notice that there are two different ways to make one left turn, but there are also some turns drivers can't make. There is no exit from eastbound US-30 to old US-30. Old US-30 traffic can't enter OH-83 in either direction, go north on OH-3, or go east on US-250. Neither northbound OH-83 traffic nor westbound US-250 traffic can turn onto eastbound US-30. Westbound US-30 traffic can't turn south on OH-83, or east on US-250. Add to that the fact that some of the exits are too close to preceding entrances. Aaaack! It's possible that this would provide complete access if it is completed. One other interesting fact is that the westbound lane of US-30 passes over the other highways, while the eastbound lanes pass under them. Unless existing topography was a factor in the design, this makes no sense. US-30 now leaves at the upper right. Old US-30 is now County-30a, running east and west. The ramps on the north side and east side of the cloverleaf have been completed. 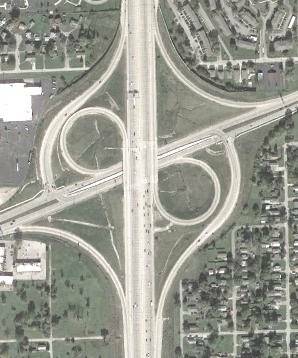 With the ramps to old US-30, it functions as a full cloverleaf. The road leaving at the right of the bottom edge now connects to a partial diamond, providing access for US-250 and OH-83 to and from the south. The ramp from westbound County-30a to northbound OH-3 and OH-83 was removed, to make room for the cloverleaf ramps. It was moved to enter new US-30 eastbound, taking traffic from both directions of County-30a. It is east of the new US-30 bridges at the left edge of the photo. Combined with the exit ramp from southbound OH-3 and OH-83 onto county-30a, it provides the movement of the missing cloverleaf loop in the southwest quadrant of the cloverleaf. The one remaining turn that was not directly provided (Eastbound US-30 to westbound County-30a) is now provided. It wasn't provided before, as seen in the old image. Terrain is the reason US-30 is at two different levels. Westbound US-30 is on a ridge. So some flyswatter interchanges are the result of temporary connections. They become more sensible when they are completed. But they may not lose their unusual configuration. The sixth flyswatter interchange example is a pretzel interchange that connects the following highways in Union New Jersey. The Garden State Parkway (GSP) runs from the lower left corner to the upper right corner of the photo. US-22 runs between the left side of the photo near the bottom and the right side of the photo near the top. NJ-82 (Morris Avenue) goes horizontally across the photo. Burke Parkway follows the left edge of the photo. Direct ramps interconnect southbound Garden State Parkway and westbound US-22. Direct ramps also interconnect northbound Garden State Parkway and eastbound US-22. Southbound Garden State Parkway and westbound US-22 have direct exits to both directions on NJ-82. Westbound NJ-82 has a direct ramp to northbound Garden State Parkway, and both directions of NJ-82 have ramps to eastbound US-22. There is a U-turn ramp from eastbound US-22 to westbound US-22 (upper right) and U-turn ramps in both directions on NJ-82 (far right). These provide all of the remaining movements. U means one of the U-turn sites. I-70 Breezewood Pennsylvania: Shame on this greedy little town for demanding through politics that I-70 must traverse a few blocks of surface streets (US-30) between the end of the free I-70 and the entrance to the Pennsylvania Turnpike, where I-70 continues as a toll road. All of the politicians involved should be impeached. In the photos, I-70 enters at the bottom, and the freeway ends in Breezewood, near the top. The route then picks up several blocks to the east, where the connector goes through the tollgates to the trumpet interchange on the left, where I-70 then leaves to the left. I-76 follows the Pennsylvania Turnpike through the entire photo, across the bottom. US-30 is the highway through Breezewood across the top of the photo. The portion of a trumpet interchange on the connector, and the diagonal road from it on the right, are parts of an abandoned section of the Turnpike. I removed them from the lower photo. The connections needed for I-70 are added to the lower photo, from the freeway to the connector. Stop signing it as I-78 where the toll road ends. Build an overpass, and convert some of the surface street connections into ramps. Close the remaining connections. I-90 Chicago: The Chicago Skyway does not have an adequate divider strip or shoulders to be built to Interstate highway standards. I-95 became complete on 09/22/2018 when two ramps at the below mentioned interchange were opened for the mainline of I-95. I-95 Philadelphia Pennsylvania to Trenton New Jersey: I-95 was complete and posted from the south through Philadelphia and around Trenton. But there, the posted route ended. Drivers had to backtrack on I-295 and I-195 to get to I-95 on the New Jersey Turnpike. Environmentalists and the New Jersey Turnpike Authority (who didn't want to lose toll revenue) killed off the original planned route from that point north. But I-95 was posted on the New Jersey Turnpike as far south as Cherry Hill New Jersey. Drivers there had to continue south, and then use I-76 to reach I-95 in Philadelphia, or use I-295 to Wilmington Delaware. One obvious route was to use I-276 to connect I-95 in Philadelphia to the New Jersey Turnpike near Mansfield New Jersey. But there was no interchange there. This interchange was left out when these highways were built. Why? Because I-276 is a turnpike. They are currently building an interchange connecting I-95 to I-276 in Philadelphia. I-95 is open to follow I-276, providing the missing section. The old alignment of I-95 to Trenton will be renumbered as I-295. The two ramps carrying I-95 are open. The rest of the interchange will be built later. But you have to already know where it is to find it. 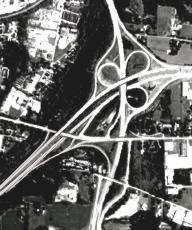 Thanks to the USGS, and also to the many people who sent me images of various strange interchanges.